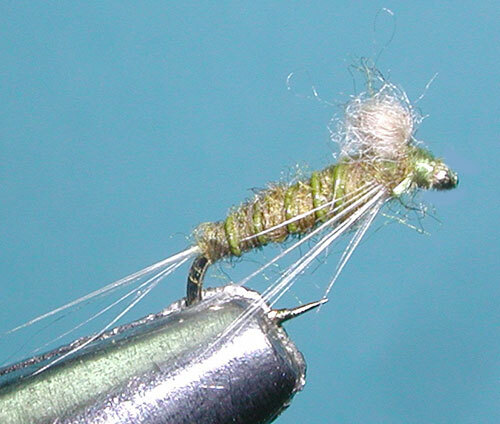 Notes: There are many floating nymphs using foam, cdc, or hackles to float the nymph at the surface. Mike Lawson of Henry's Fork Anglers developed an interesting pattern using a ball of poly dubbing to float the fly. What makes this pattern unique from other floating nymphs is that the profile of the nymph lays low within the surface film and is sighted by the angler from the ball of poly. The poly dubbed wingpod has been used by others such as Darrel Martin, who actually learned the technique from Klaus V. Bredow, a European tier. Mike Lawson attributed his version of the pattern to one described in Doug Swisher and Carl Richards, "Selective Trout". There are many color variations depending upon the specific mayfly. 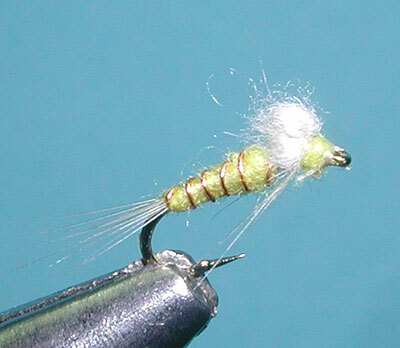 The floating mayfly should use the same colorations as the adult dun. 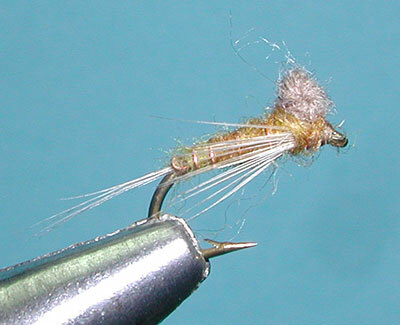 This pattern is particularly usefull during the hatches of small mayflies smaller than size #16. Nymphs of most mayflies rise to the surface and get stuck in the surface film of the water. This surface film can become a real barrier for the smaller mayflies. During this time, the adult will try to crawl out of it's shuck to fly away but, often, they are an easily available meal to the trout that target them during this susceptible time. Look for bulges in the surface from the trout that are feeding on the subsurface nymphs.